Several years ago I wrote an article for this group about Peter HT Woo, the “Father of the HK Electronics Industry”, whose radio assembler Champagne Engineering (founded in 1958 and later renamed Atlas Electronics) is often credited as the first electronics company in Hong Kong. Another early HK electronics industry pioneer was a 210 pound, husky American airline pilot/racecar driver by the name of George M. Baker, whose International Service Corporation Ltd (國際有限公司) began making transistor radios in 1961, manufacturing brands such as Kent and Fiesta. 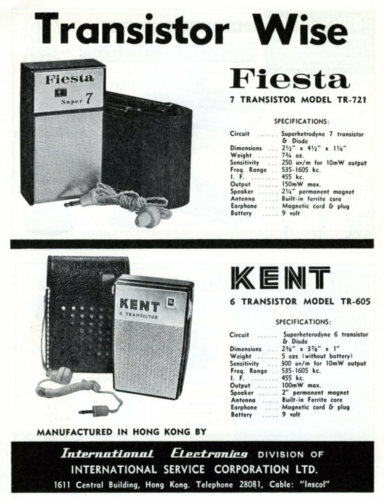 By the end of 1962, the number of transistor radios exported from Hong Kong exceeded 1 million annually and Baker led the charge in founding the Radio and Electronics Manufacturers Association in April 1963 to promote and protect the interests of the radio manufacturers and to improve the image of the nascent HK electronics industry to global buyers. The group counted 10 full corporate members and 15 associate members at inception and held its first meeting at the Gloucester Hotel in Central with Baker elected as its first chairman and Adrian Michael Cappon (Israeli director of Atlas Electronics at the time; later involved with Wireless Products, Arvin Electronics and Audio Mechanical) as vice chairman. George Baker was born in New York in 1924. According to a 1960 Wall Street Journal article which profiled three American entrepreneurs in HK (other two being Bob Newton of American Marine and Bireley’s and Linden Johnson of Mandarin Textile – to be covered at a later time), Baker arrived in Hong Kong in 1953 as a pilot for Pan Am. Like many airline pilots at the time, he supplemented his income by dabbling in export/import of goods between hops and formally established International Service Corporation Ltd in HK in 1957 to handle imports of automotive products such as polishes and accessories. A sports car enthusiast, he won the Macau Grand Prix 100 Handicap Race the same year. When he couldn’t find adequate service for his 2 Ferraris and Ford Thunderbird, he branched out into the auto mechanic business by setting up The Speed Shop in a garage at 5 Seymour Terrace in the Mid-Levels in 1958. The same year, he quit Pan Am to focus on his businesses full time and by 1959 his enterprises were pulling in over US$110,000, a sizeable sum back then. From car parts and garage, The Speed Shop expanded into the dealership business when it secured the Far East distributorship of Ferraris and also represented a number of other sports cars such as the Italian brand Abarth (later absorbed by Fiat) and the UK brand Berkeley (which only existed between 1956 and 1960). Soon the entrepreneurial Baker branched out into other businesses, including shipping shirts to West Germany, guiding tourists in HK and representing 24 manufacturers including Rolley Inc (maker of the Sea & Ski suntan lotion, then one of the most popular brands) and Toptex (racing helmets) in Asia. It didn’t take long for Baker to smell profits in the nascent transistor radio industry and when he found a company in England which was interested in buying 100,000 transistor radios in 1960, he started the International Electronics division of Intl Service Corp and leased space in an 8 story industrial building to set up a factory with machinery capable of churning out 10,000 radios per month. By 1964, sales of International Electronics grew to US$2 mil and he was manufacturing a variety of radios including waterproof ones for yachts. When asked in his 1960 interview with the Wall Street Journal whether he was concerned about potential Chinese Communist takeover of Hong Kong, Baker replied that he didn’t know it will happen and “don’t particularly care”. Within a couple of years however, The Speed Shop was dissolved in 1966, the Radio & Electronics Manufacturers Association was dissolved in 1967 and International Service Corp also faded from the scene. This article was first posted on 21st April 2017.